CB-800/CB-800S Getting Started - NexSens Technology Inc. Prior to buoy setup and deployment, it is essential to test the monitoring system (sensors, data logger and telemetry) on shore. This is the most important part of the setup process because it allows users to familiarize themselves with the system while confirming that everything is operating properly. Connect all sensors, power the system, and gather sets of sample data with iChart software. Refer to the SDL500 and iChart categories for additional information on setup and testing of the software, data loggers and sensors. Systems may also ship with project-specific startup documentation provided by NexSens Customer Support. Before deploying a CB-800 data buoy , it is very important for the user to become familiar with the hardware connections and operation of the system with iChart software. To begin, lay out the buoy, sensors, data logger and other components that make up the CB-800 system. Follow the steps below to test and assemble the system. CB-800 data buoys are designed to accommodate the SDL500 Submersible Data Logger for connection of monitoring instruments. On CB-800 systems without solar charging, the SDL500 is powered with D-cell alkaline batteries. A communications antenna may be installed in the SDL500 top bulkhead port for radio, cellular or satellite telemetry systems. 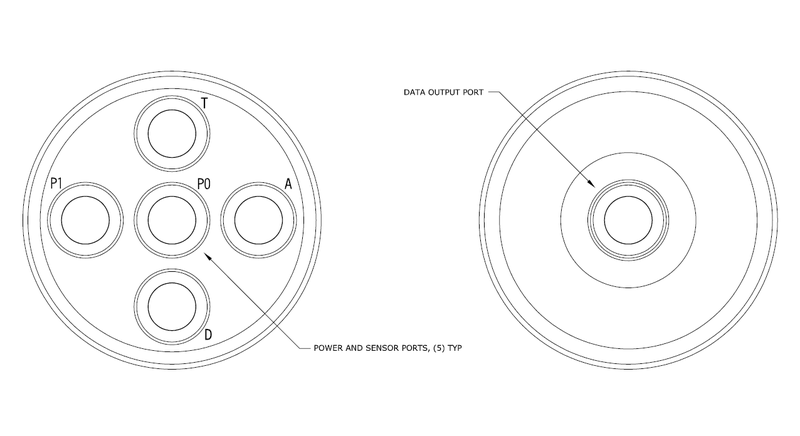 Sensor connections are made on the top port and/or the five ports on the bottom bulkhead. All sensors and devices must have a NexSens UW connector factory installed in order to connect to the SDL500. Consult the SDL500 manual for detailed information on the port characteristics to aid in assigning sensors to the appropriate ports. The available ports are shown in Figure 1 below. CB-800S systems include an RBP500 Rechargeable Battery Pack and a solar charging kit comprised of three 10-watt solar panels and a power harness with solar regulator. Figure 2 is a schematic drawing showing how these components are connected together along with the SDL500. The three 10-Watt solar panels are harnessed together and connected to a solar regulator. This assembly is connected to Port D on the RBP500. Pass-through signals are enabled on the bottom bulkhead of the RBP500 by connecting UW-1P cables from the SDL500 to the RBP500 top bulkhead as shown. The CB-800S package includes (1) UW-1P cable that connects from Port P0 on the SDL500 to Port P0 on the RBP500 top bulkhead. This enables sensors to be connected to Port P0 and Port D on the RBP500 bottom bulkhead. The basic setup for a CB-800 buoy system requires installing sensor cables, connecting sensors and the RBP500 to the SDL500 data logger, installing the SDL500 in the buoy tower, securing the buoy lid, and installing protective pipe caps. The following steps walk the user through this process. Warning: The buoy is very heavy. Take care to lift properly and wear necessary lifting gear (e.g., back braces). Always wear gloves when handling the buoy to protect hands as the buoy may have sharp edges or points. Three people are required for safe lifting. The buoy has three 4” PVC sensor deployment pipes for deployment of water monitoring instruments. Starting at the bottom of a sensor deployment, feed sensor cables up and into the center chamber of the buoy tower. The cables enter the center chamber through a small slot. Be careful to keep the slot in the sensor deployment pipe lined up with the slot of the buoy tower throughout buoy setup.